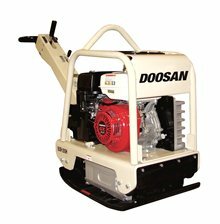 The BXR Series of reversible vibratory plates from Doosan Portable Power are engineered for the best compaction of granular soils, mixed soils, and well-graded aggregates where turning around can be difficult or impossible with other plate compactors. Our open base plate design permits dirt and rocks to slide off the plate for easier cleanup and our protective engine cage with integrated lifting bail provides engine protection and easy loading placement into trenches. The BXR-200H is engineered for the best compaction of granular soils, mixed soils, and well-graded aggregates where turning around can be difficult or impossible with other plate compactors.